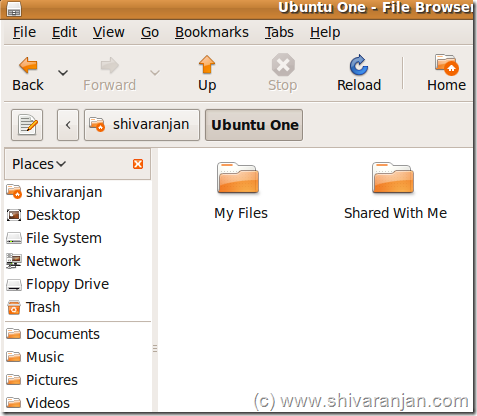 Ubuntu One as we know is a competitor to Dropbox service but the Ubuntu One client can be only installed in Ubuntu Linux. In future Ubuntu One will have cloud computing features and in this post we shall review the various features of Ubuntu One are currently available. The installation of Ubuntu One was very simple and can be installed quickly, for detailed installation instructions read this article. After you install Ubuntu One client a folder called Ubuntu One will be created in your home directory. To quickly access the Ubuntu One folder just left click the Ubuntu One icon in your taskbar. You can add your files in the folder called ‘My Files’ and Ubuntu will automatically upload it. The syncing of files happens automatically the moment you add a file or folder the client will automatically upload it. You can also add folders and files using the web interface, you can directly login to web interface by using the ‘Go to Web’ option that would be available if you right click the Ubuntu One client icon in the taskbar. 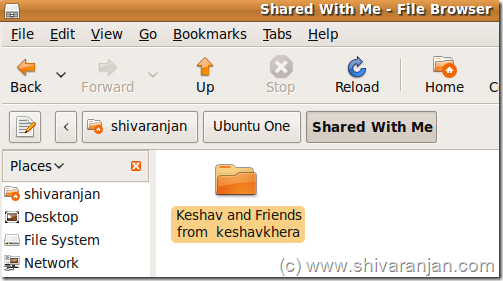 In the folder called ‘Shared With Me’ you will be able to see all the folder and files that your friends or other people have shared. Below you can see that the a folder that has been shared with us. There is no option to share a file or folder from Desktop or local client to share a file you would have to go to the web interface. To share folder you have to go to the web interface and then use the sharing tab to share a folder, to share a folder you have to enter the email address of the person with whom you wish to share the folder. Please note that the email address should be linked to a Launchpad account. If you want to make the folder read only the you have to check the ‘Read Only’ check box and the person will be able to download the files but will not be able to change the contents of the shared folder. 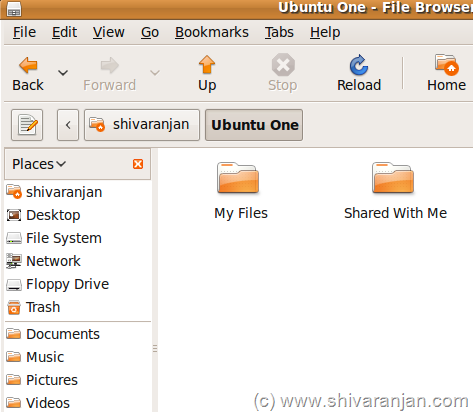 You can also access the shared folder that has been shared with you by other people and also you can upload files using the web interface this is useful if you want to upload files from a non-Ubuntu computer. 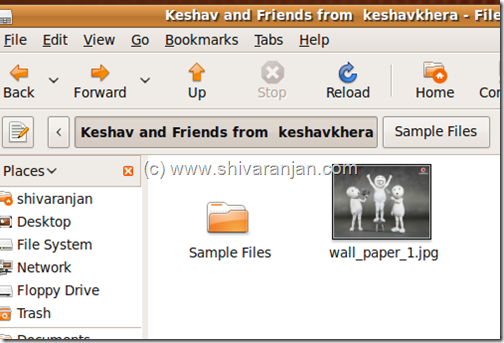 If you have very big files to share then this is the best way to share files and folders securely with your friends. The web interface is pretty neat can be logged in by using web browser if Ubuntu One client is installed then you can directly access it by using the ‘Go to Web’ option. The folders are shown on the left hand side of the screen and you can see all the sub folders as well. The contents of the folder are visible in the center column once you click on a folder that are visible in the left had side, details like file type and last modification time and date are provided. On the right hand side of the screen you can see the properties of the folder like size, sharing status, name of the owner and etc. The account management can be done performed from here, the computers that are currently authorized are listed here. If you want you can remove a particular computer that you had previously authorized. It would have been good if there was an option to check the disk usage which is a must we feel to have a check on disk usage. Ubuntu One is a good initiative but currently it needs some more improvements, the desktop or local client needs more functionality and there is no option to set the syncing frequency. The major drawback is that the local client can only be installed in Ubuntu Linux but many Linux users also use Windows and other Linux Distros so it would be appreciated that clients for other operating system are also released. If you compare Ubuntu One with then the Dropbox is clear winner as Drop box supports all current operating systems and even the paid service of Dropbox offers more disk space than the Ubuntu One. We would say that Ubuntu One is good startup and if you only exclusively use Ubuntu Linux then this the best service for you as the free account offers 2GB of disk space and the paid version offers 10GB for USD 10 per month. In future Ubuntu One will have integration with applications and cloud computing so it is more than just file and folder sync so we suggest that you start using the free version now.